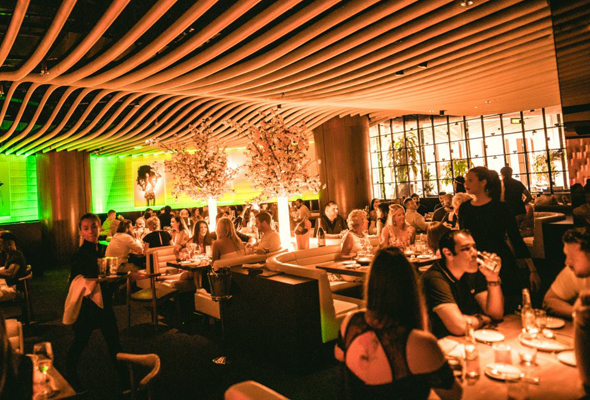 So popular is STK’s double dose of party brunch on Fridays, the sleek steakhouse has just launched a brand new offering – a Thursday evening dinner party deal. ‘Rare’ is a three hour package that will run from 8pm to 11pm every Thursday from Thursday February 7. It’s available at both the JBR and Downtown branches too, a perfect weekend warm up whether you’re looking to party in the Marina or Downtown. Priced at Dhs299 including free-flowing house drinks, expect to tuck into a three course sharing menu of quinoa salad, salmon and seabass ceviche and sliders to start, followed by an array of mains including cauliflower risotto, roasted salmon and their signature steak all brought to the table. It’s finished off with a choice of New York cheesecake or cookie dough and creme brulee. It will all be served up to a playlist of lively hiphop hits spun by the venues resident DJs. And if its Thursday evening events your after, then you’re in the right place. PizzaExpress’ popular The Stage Brunch has been such a sellout in JLT, Love Parties have now launched the brunch package in Business Bay. Guests can expect to tuck into the same brilliant package of unlimited starters (which include those drool-worthy dough balls), an a la carte main and free flowing drinks for Dhs225, or upgrade to the sparkling package for Dhs275. After 11pm, there’s a brilliant deal as the live music continues with five drinks priced at Dhs150. STK JBR The Walk, Rixos Premium Dubai The Walk, JBR and STK, Downtown, Address Downtown Dubai, Sheikh Mohammed bin Rashid Blvd, 8pm to 11pm, Thursdays, Dhs299.